Isaac Sears, son of John and Sarah Wagstaff Sears, was born in Upper Caldecot, Bedfordshire, England, December 2, 1845. He was the second child in a family of eleven children, and as the parents were very poor it was necessary that every one work in order to help get a living. At a very tender age the children were taught to plat or braid straws which their mother afterwards made into hats to be sold. 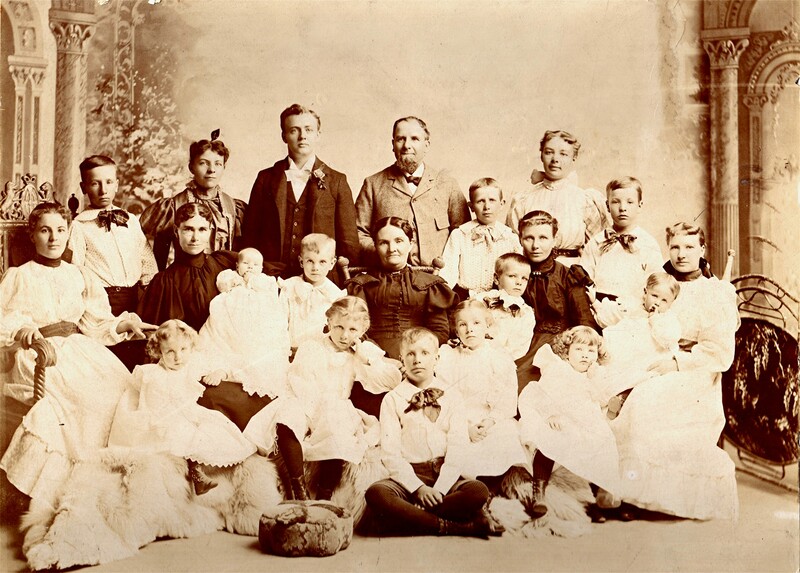 In the year 1849, the family joined the Church of Jesus Christ of Latter-day Saints. A few years later, the eldest son, Septimus, was called to serve as a missionary and one night came home to tell his parents that he had been able to obtain passage for one on a ship bound for America and suggested that Isaac be sent. This was agreed upon and a short time later, with a grip sack of clothing, he left his home to journey with strangers to far off Zion. He was then about 17 years of age. The sailing vessel on which he crossed the Atlantic made the trip in about six weeks, and then began the long journey overland to Utah. After leaving the train at Missouri, he walked all the way across the plains and arrived in Salt Lake City, Utah in the fall of 1863. From here he was sent with some others to southern Utah where he lived with a family and worked at anything he was told to do. Food was scarce and the people lived on roots and wild game and anything else they could get. They were married September 28, 1867. Isaac used to tell of the dances they attended while he was courting Sarah Jane, and of how she used to ride back of him on the same horse. He had to use one hand to carry a squash or some other kind of vegetable to pay their way to the dance. Therefore, he had to guide the horse, hold the squash, and have the girl hold on to him. Sears home at 756 East 2nd South in Salt Lake City, Utah. 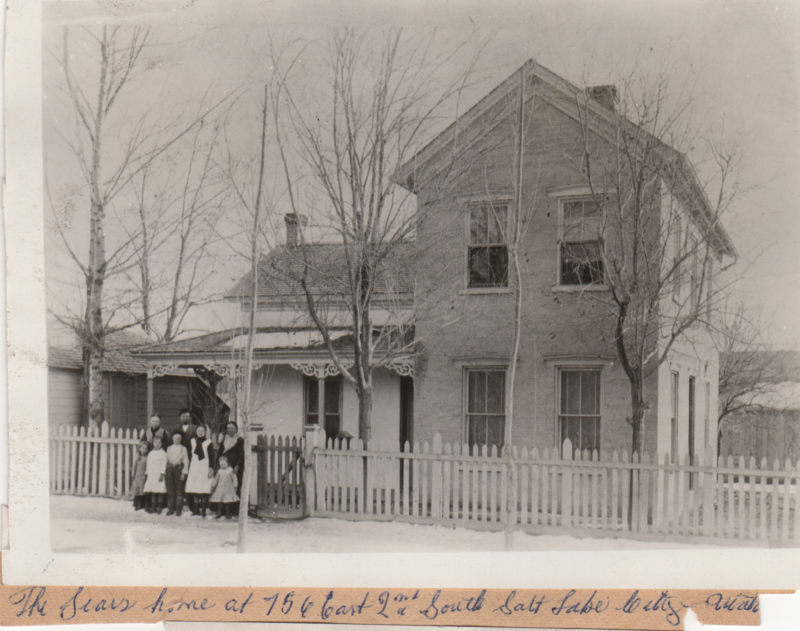 Their first two children, a girl and a boy, were born in a one-room log house in Kaysville, and when the younger one was a little over a year old, they moved to Salt Lake City and made their home in the 11th Ward at what later was 756 East 2nd South. The moving was accomplished by means of a horse and mule hitched to a wagon in which was loaded their household belongings. Besides the family of four, the family cow was tied to the back of the wagon. The little girl, Mary Ann, kept asking her father to get out of the wagon and milk the cow as she was thirsty. At first they lived in a tent while Isaac built two rooms, one above the other. Before they could move into the home, their little son, Isaac, died. 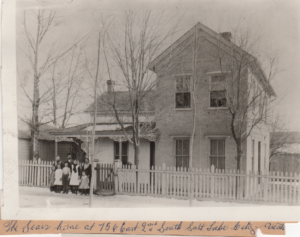 As the years went by, the house was enlarged as the family grew in numbers until it was a large house of nine rooms. Nine children grew up here and three little boys died. The fifth child, Etta May, died less than a year after her marriage, at the age of 23. Isaac had no schooling whatever as a child but after his marriage he studied and attended night school and became quite a proficient penman and business man. With his younger brother, Nathan, he engaged in the hay and grain business and their first store was on Main Street, near ZCMI. Later he had other partners in the same business and the firm name, Sears and Jeremy, was a familiar one in Salt Lake City for many years. He also engaged in the refinery and sale of salt and in addition at one time owned a large herd of sheep. 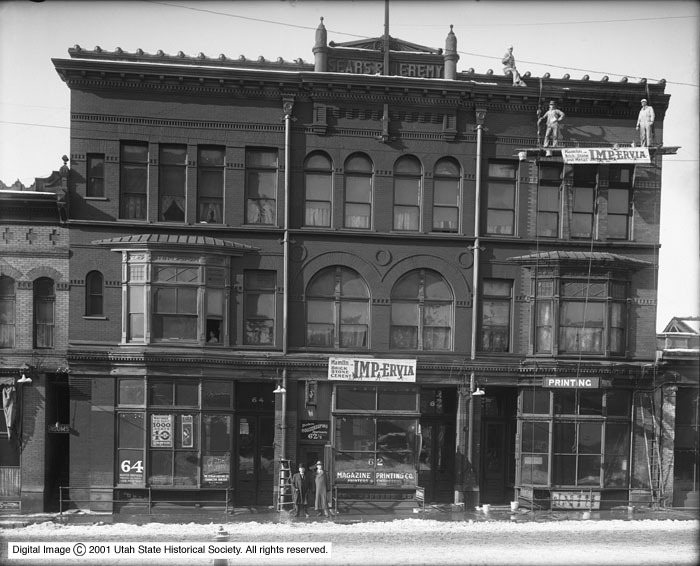 Image taken on December 13, 1911 shows men working to repaint the Sears and Jeremy Building. 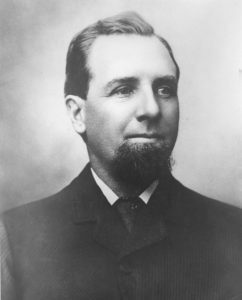 Image is linked to the Utah Department of Heritage and Art Collection. He married two other wives, Louisa Strickland and Alice Norris. In February of 1889, Isaac was called on a mission to England where he labored for about twenty months, arriving home in the fall of 1890. He was always active in Church affairs and for more than twenty years was counselor to Bishop Robert Morris in the 11th Ward, a position he held up to the time of his death, which occurred October 3, 1912. Had he lived a few weeks more he would have been sixty-seven years old. He left a large family who revere him for his many excellent qualities of mind and heart. He was a good citizen, a true friend, and a wise counselor. He remained steadfast and firm in his faith in God and His revealed Word, and passed on with full assurance of a glorious resurrection. 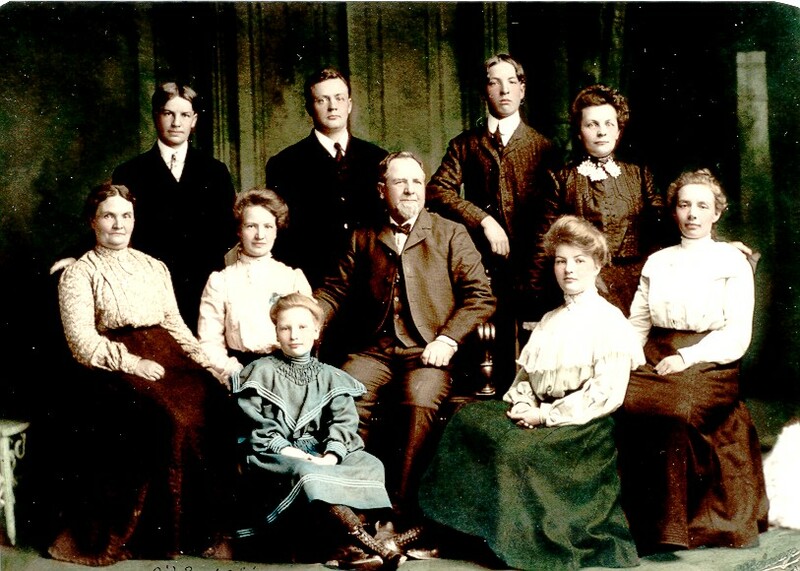 Isaac and Sarah Jane (Gailey) Sears and Grown children, c. 1902.